Our Artisan breads are made the old world way, using only natural ingredients, time, and baker’s skill to create an exquisite artisan loaf sure to enhance your dish or sandwich to a new culinary measure. 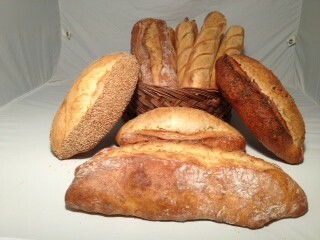 Our Artisan bread is always best consumed the day of purchase. 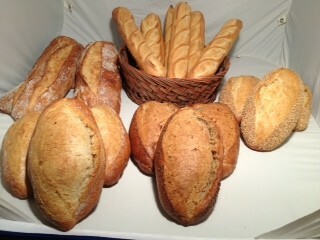 Our breads are always best consumed the day of purchase. But our loaves can be preserved by freezing and refreshing in a heavy plastic bag. When you’re ready to eat it, defrost the bag until thawed, then take it out of the bag, preheat your oven to 450 degrees, sprinkle some water on the crust, and bake directly on your oven rack for 5-10 minutes. Our Semolina has a very soft crumb. It is slightly chewy but almost melts in your mouth as you taste it. 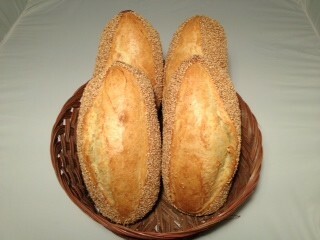 Try to notice the sharp contrast flavor between the crispy crust and the sesame seeds. This brawny Italian loaf serves as a reminder to the toasty, crusty, honest, loaves of old. The word Ciabatta in Italian literally translates into “slipper” Our Cabatta is slightly crispy on the outside with a deliciously tender and airy crumb which makes for amazing sandwiches or garlic bread. But to achieve this flavor, it is best consumed on the day of purchase. 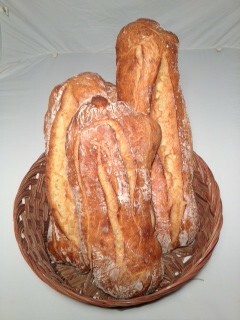 We bake a traditional French bread slowly fermented in small batches. When you take your first bite, you’ll notice our crust slightly shatters like a thin hard candy. 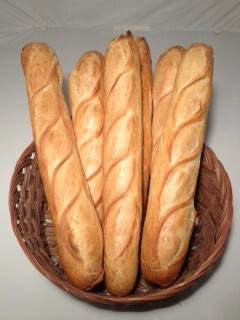 The crumb of our baguettes is creamy. Our baguettes are the perfect complement to any cheese, butter or jam, spread, and are most satisfying to eat immediately after purchase. There are not enough adjectives to describe how absolutely delicious our sourdough bread is. 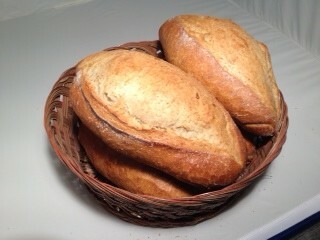 It is a dense like a naturally fermented sourdough should be, yet it is very moist inside its thick crust. And because of its thick crust, our sourdough bread makes amazing french toast. 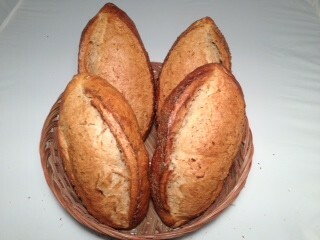 Unlike many rye breads you find today, we bake our authentic rye loafs with real rye flour. Our rye is dense, dark and faintly sour. It’s a real workaday rye that is perfect for spreading butter on or slicing up to try with your favorite corn beef dish.